Built by Alexander the Great in 332 BC, Alexandria was intended to be the port which would link the old worlds of Egypt, Babylon, Persia, and Greece. Following Alexander’s death, Alexandria became a world city under the rule of the Ptolemies, the dynasty founded by his Greek General, Ptolemy. The Ptolemies used their resources to develop knowledge, art and culture and establish the city as a centre for science, religious thought and literature. It was within the complex of libraries, parks and halls of the fabled Mouseion that stood in the centre of the city that Euclid wrote his ‘Elements’, Eratosthenes calculated the circumference of the earth, Herophilus pioneered the study of anatomy, and the ‘Julian’ calendar, based on the ancient Egyptian solar calendar, was devised. Most dynasties are named after their men. However, through time some women have come out being the most exceptional, and none more so than Cleopatra VII (51-30 BC). Coming to power at the age of 18, she was the wife and sister of Ptolemy XIII. The political saga that ensued between the Romans and Ptolemies in their bid to control Egypt was rich in love and war. When Julius Caesar defeated the Egyptian navy in the Mediterranean Sea, Cleopatra’s brother and husband was drowned. She went on to marry her younger brother Ptolemy XIV and become Caesar’s mistress, bearing him a son. After Caesar’s death, she became the mistress of his successor, Mark Antony. According to romantic legend, when Antony was killed by Augustus, she committed suicide by pressing an asp to her breast. The Caesareum, Cleopatra’s gift of a temple to Antony, now lies buried under the Cecil Hotel. Facing it, presently submerged under the Mediterranean Sea was the ancient palace. Until the 19th Century two obelisks brought from Heliopolis, an ancient Egyptian city, marked the site of the temple. Today the obelisks stand at New York’s Central Park and London’s Victoria Embankment. Alexandria is necessary to understand the past and present. It is a city where an ancient civilisation, under the influences of Greek and Roman culture and Christianity, changed shape to become ‘western civilisation’. The first impression of Alexandria can be disappointing. Rows upon rows of concrete high-rise buildings criss-cross the entire city and line the corniche, vying with each other for views of the Mediterranean Sea. Where then is the Alexandria of culture, knowledge, love and beauty. Amidst the concrete are scattered pieces echoing its glorious past. And as the pieces fit into each other, the Alexandria of old lives once again. The best place to start understanding Alexandria is the Graeco-Roman Museum. Busts, sculpture and objects d’art brought in from sites at Alexandria and nearby give a wonderful insight into an art that is a blend of ancient Egyptian and Classical forms, and is unique to Alexandria. As one sees the transformation of the ankh, the ancient Egyptian symbol of life into the Coptic cross, Graeco-Roman mummies adorned with Egyptian and Greek motifs and encaustic paintings [lifelike portraits painted on to mummy cases], and statues of Serapis, the God of Alexandria who was a combination of the Greek god Dionysus and Egyptian god Osiris, the past and present flow into each other. Busts of Alexander the Great and Roman emperors, statuettes of Greek women, lamps, vases and coins paint a picture of Hellenistic style and elegance. The Coptic [Egyptian Christian] Section has a collection of beautiful textiles for which the Copts were renowned for. 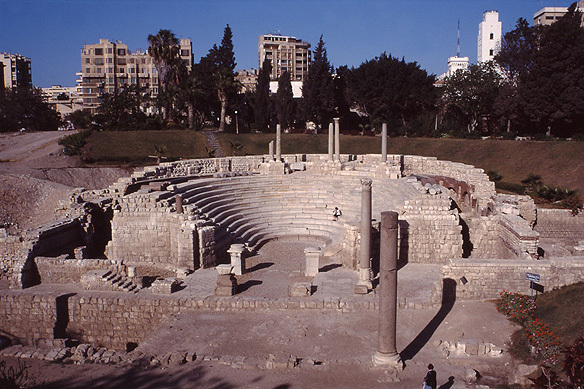 Egypt’s only surviving Graeco-Roman theatre is the Roman Theatre, Kom el-Dikka. The elegant covered amphitheatre for musical performances dates back to the 2nd Century AD, undergoing many alterations in antiquity. A 1,800-year-old street runs past it into the hill. Uncovered by Polish authorities in the 1960s, the theatre was buried under layers of time: a late 18th Century fort, several centuries of Muslim cemeteries, and Roman remains. Current ongoing excavations by the Polish have further unearthed Roman baths, cisterns, villas, shops, and streets at the site. Steps lead from one room to another with doorways opening onto the streets while exquisite mosaic floors and shards of pottery lie in the dust of millennia. Also from the 2nd Century AD are the Kom el-Shogafa Catacombs, the biggest Roman funeral complex in Egypt. Originally a private burial ground, it later developed into a cemetery complex for the community with more than 300 coffins. Ninety-nine steps lead around the shaft into three layers of tombs. Mummies were sent down the shaft with ropes and slid into their coffins. On the first level is the Rotunda and Banquet Hall where families came to feast in memory of the dead. The second level is liberally embellished with tomb decorations in the unique blend of Egyptian and Classical styles that is typical of Alexandria weaving periods of history into a rich, hybrid pattern. Bearded serpents wear the double crown of Upper and Lower Egypt, bas reliefs in niches over sarcophagus illustrate Egyptian motifs, themes and gods, and figures of Egyptian gods stand guard, dressed as Roman legionnaires. 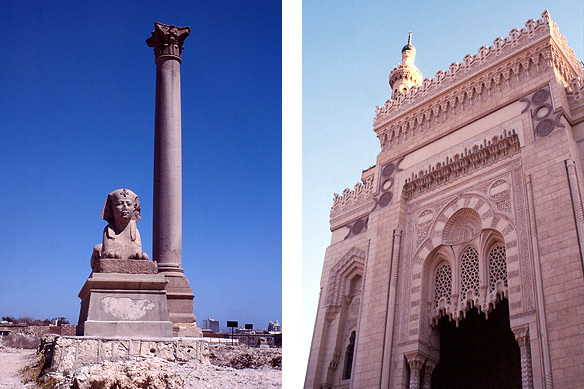 Alexandria’s most famous landmark, Pompey’s Pillar and the two Ptolemaic sphinxes nearby, stand in front of the remains of the Serapeum, temple of Serapis, one of the most important buildings of Ancient Alexandria. The Serapeum and the library built by Cleopatra next to it were completely destroyed by 4th Century Christians. One can, however, still climb down the rock-hewn steps into the library. 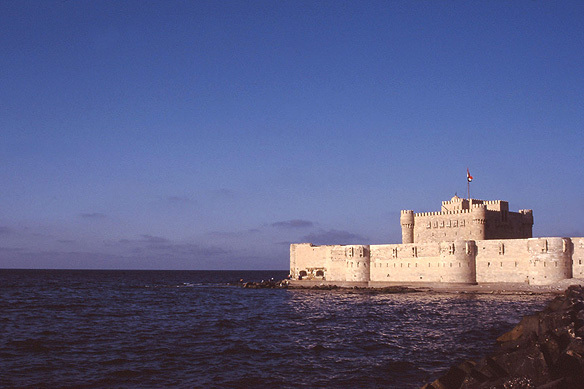 Built at the site of the legendary Pharos Lighthouse on the eastern harbour is the fairytale-like Qaytbay Fort. The original lighthouse was built by the Ptolemies in 279 BC and was one of the Seven Wonders of the Ancient World. Standing 125 meters high, it had more than 300 rooms for its mechanics and attendants. An earthquake destroyed it in the 14th Century. The Qaytbay Fort was built by Sultan Qaytbay in the 15th Century with the very same stone blocks. Making for a pleasant evening walk are the 350-acre gardens of the Montazah Palace, the summer presidential residence. The palace was built by Khedive Abbas II in the turn of the 19th Century and is Turko-Florentine in design. Sometime in the 1st Century AD, Egyptians began converting into Christianity. By the 2nd Century, the new religion was firmly established. Christianity attracted many converts in Egypt as the religious texts were translated into Coptic and, therefore, appealed to a wide audience. The Egyptians’ new found faith clashed with the Roman intolerance for it, causing many early Copts to flee into monasticism. There was also a growing division between followers regarding the ‘nature’ of Jesus. In the 5th Century, an edict from the new Roman capital, Constantinople [now Istanbul] declared that Christ was one person with a dual nature of father and son. The Copts refused to accept this, firmly believing that Christ was God at all times. Ever since then the Coptic Orthodox Church has stood alone. 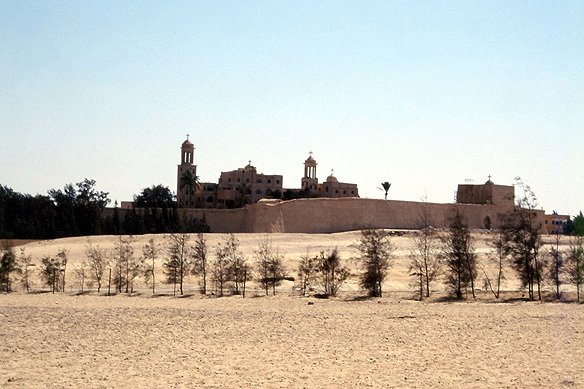 Monasticism began in the eastern desert in Egypt. However, the cannons for monasticism were developed in the monasteries of Wadi el-Natrun, halfway down the desert road linking Cairo and Alexandria. It is from these same monasteries that Coptic Popes have been chosen for the past 1,500 years. 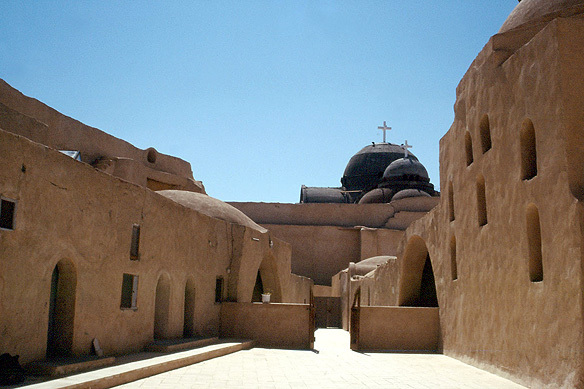 Wadi el-Natrun comprises four monasteries (4th Century), the most popular being Deir Anba Bishoi and Deir ei-Suryani. All follow a similar plan, surrounded by heavy walls and containing several churches. They are now easily accessible and open to the public. Simplistic in design, the soft yellow buildings blend with the surrounding desert. Inlaid doors and striking frescoes cover the dim interiors, whilst Coptic monks in black habits and embroidered cowls go about their duties in hushed silence. The best way to visit Alexandria is by hiring a taxi for two days from Cairo and staying either at the Cecil Hotel facing the corniche or the Helnan Palestine Hotel in the Montazah Gardens. Both are historical hotels with incredible charm and breathtaking views of the Mediterranean Sea. Travelling by taxi allows for the freedom to discover Alexandria at leisure and ensure a stopover at the Coptic monasteries at Wadi el-Natrun on the way back to Cairo. This entry was posted in Egypt, Exploring our World and tagged Alexander the Great, Antony and Cleopatra, Classical Greece, Coptic Monasteries of Wadi el-Natrun, Coptic Orthodox Church, Graeco-Roman Museum, Kom el-Dikka, Kom el-Shogafa Catacombs, Mouseion, Pharos Lighthouse, Pompey’s Pillar, Ptolemaic Dynasty, Seven Wonders of the Ancient World, Things to see in Alexandria by Rama Arya. Bookmark the permalink.